April 12, 2017 – More companies than ever before are setting water targets, yet global water stress continues to rise. How can companies ensure that their water targets align with meaningful outcomes? A new discussion paper released today by CDP, The Nature Conservancy (TNC), World Resources Institute (WRI), WWF, and CEO Water Mandate (a project of the Pacific Institute and the UN Global Compact) calls for a new context-based approach to setting meaningful water targets. 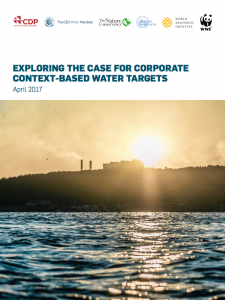 The paper calls for companies to set water targets that take into account the unique contexts of the basins in which they operate. Since water issues are primarily local, each basin has particular challenges that need to be considered when managing its water resources. Context-based metrics and targets recognize these unique challenges, allowing for physical and social thresholds and tracking water use relative to basin thresholds and availability. Context-based corporate water targets are not only necessary for protecting water resources – the paper shows they also offer business value. Such an approach would help drive corporate alignment with effective public policy water goals, such as the Sustainable Development Goals, while mitigating business water risk. Interested organizations and practitioners are invited to support this project towards the development of a common approach to identifying context-based water targets.